It’s the most inaccessible art gallery in the UK – perched spectacularly on a craggy cliff top with breath-taking views overlooking the Irish Sea. 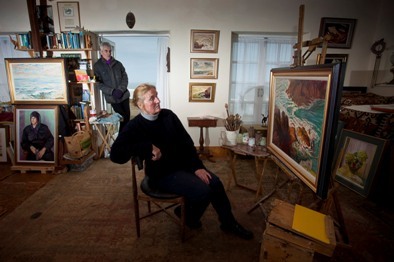 Over Easter weekend adventurous art lovers will be beating a path to see the work of artist Philippa Jacobs at her isolated home and studio at the 19th century fog signal station at North Stack on Anglesey. Getting to the remote location, half way between the port of Holyhead and the bird sanctuary of South Stack, is not for the feint hearted though. There aren’t many options. The least scary route is the coastal path which skirts the cliff edge from Breakwater Country Park on the outskirts of Holyhead while Philippa uses the four-wheel drive capability of an ageing Land Rover to navigate a deeply cratered track which undulates wildly over the steep, rocky terrain. It will take around 20 to 25 minutes to walk there. That’s about the same time as it takes Philippa to drive – anything above crawling pace in the Land Rover would constitute sheer recklessness. Philippa is one of 55 artists from Anglesey who are throwing their doors open so people can come to see and hopefully buy their work. The Open Studios and Galleries event is in its ninth year and is organised by Anglesey Arts Forum. This year sees the Forum working in partnership with Helfa Gelf/Art Trail with the launch of the North Wales Open Studios Network , a scheme that reaches across the region from Anglesey via Gwynedd in the West to Wrexham in the East. The Network is part funded through the Rural Development Plan for Wales 2007 – 2013, which is financed through the European Union and the Welsh Government. The Anglesey event begins on Saturday, March 31, and continues until Sunday, April 15. As well as being able to visit artists in their own homes, there will also be exhibitions at the Ucheldre Centre, in Holyhead, and the David Hughes Centre, in Beaumaris. The tie up with the Helfa Gelf/Art Trail as part of the NWOSN project has also provided funding for a new website, promotional literature and guided bus tours to visit artists’ studios. Last year more than 100 determined art lovers trekked to see Philippa’s exhibition – and she’s expecting even more people to make the effort when she opens over Easter Weekend, between 2pm and 5pm, from Good Friday through to Easter Monday. One reason is that this could be the last opportunity to visit her in the stunning environment that so inspires her work. Philippa is selling up and has put the property on the market for £595,000 because living in the splendid isolation of North Stack is becoming an increasing challenge. Philippa has been living there for 23 years, despite the absence of any facilities other than electricity. 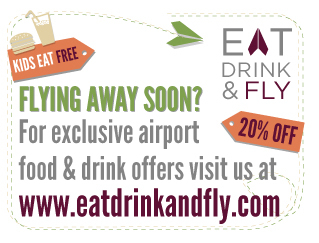 There’s no mains water, no postal service or refuse collection. There are three main buildings set in half an acre of land. Among them are a three bedroomed house and a former Magazine building that use to house gunpowder and a cannon that fired fog warnings to shipping. 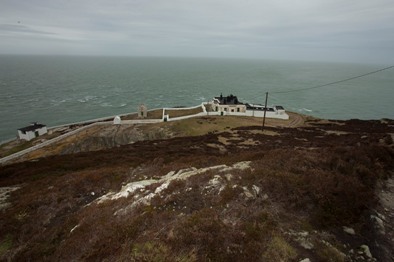 Then there’s the fog signal building itself where an array of ear-drum blasting fog horns have mercifully been disconnected – the new fog horns are now based across Gogarth Bay next to the South Stack lighthouse. Perhaps unsurprisingly the theme of Philippa’s exhibition this year is The Irish Sea. More information about Anglesey Arts Weeks – Open Studios and Galleries 2012 and the artists involved where you can also download a copy of the official Guide.